I haven’t been spinning much in recent months. Actually, I take that back, I haven’t been spinning at all in recent months. Mostly because I’ve had issues with my back (flare-ups causing crazy amounts of pain = no crafting for me!) and also because I’ve been rather absorbed by certain knitting projects with deadlines. I’m happy to report that I’m back on my wheel again – although I still have to be careful about my back. My project for last Wednesday evening was to finally finishing Navajo plying some lovely FatCatKnits Falkland wool singles into a 3 ply yarn. This is the same yarn that I was spinning in my LSG NSFW calendar photo. Short Digression: this year’s LSG NSFW Calendar has gone to seed (= never happened), so I’m going to resubmit my photo from last year and perhaps take a new one for next year’s 2013 calendar. Wish me luck – voting is in November, so I’ll do up a reminder blog to vote for me, if you are indeed an LSGer. The yarn gave me the impression of driftwood and sea glass on the beach, so that’s what colourway I’ve dubbed it. The colours move from sandy deep browns, to dusky amethyst, to aqua blue, to sea-greens. 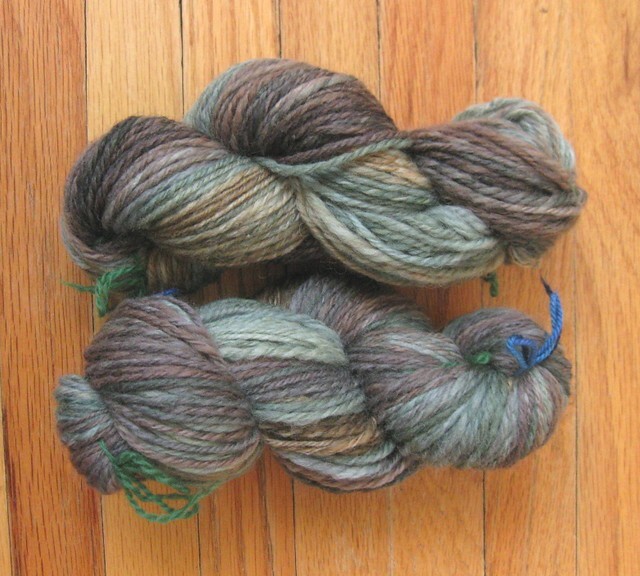 I’m not planning on selling this handspun, mostly because I’m in love with the colours and I adore how Falkland feels. I honestly do not recall when I originally began plying this project, but it was several moons ago. 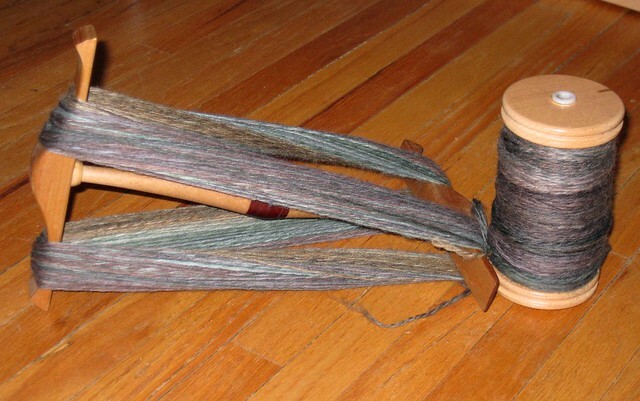 I was beginning to get a afraid that my singles would lose their twist and that the plying would be hellish. So, with a fair amount of determination, away I went to work plying these single yarns. The result? 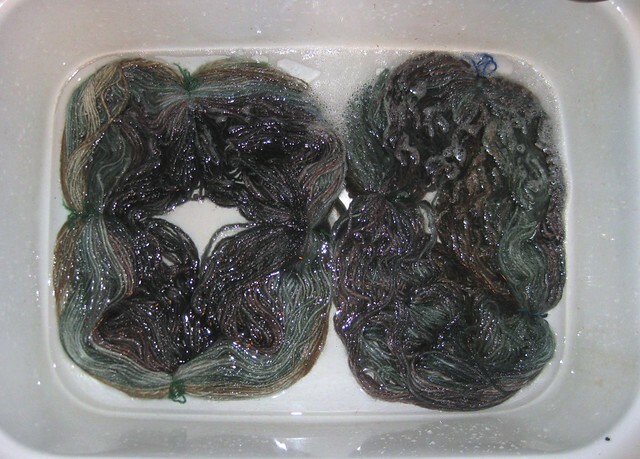 I managed to ply and and skein two hanks, one with 115 yards and one with 151 yards (total yardage count = 166 yards). I’m quite pleased! 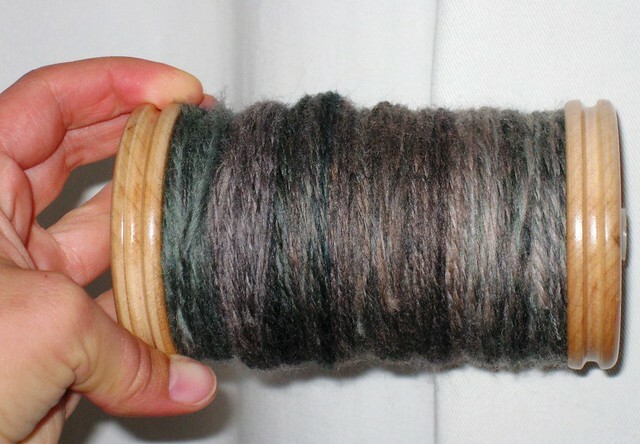 I still have another 4 ounce bump of Falkland roving to spin up. Meaning that when all is said and spun, I’ll have around 500 yards of lightly worsted yarn to knit with. The next question that follows, is what should that 500 yards become? Please leave your suggestions in the comments below, I’m seriously stumped! You are currently reading On the wheel again… at When Gaia Smiles.